1. Working on behalf of the Griffin Capital Essential Asset REIT, Griffin Capital Co. has acquired the McKesson Scottsdale Campus from Ryan Companies US Inc. for $67M. Cushman & Wakefield’s Chris Toci, Chad Littell, Greg Mayer and Jim Wilson represented the seller in the transaction. The deal was done with 1031 exchange proceeds from the disposition of DreamWorks Animation’s Headquarters and Studio Campus, which the REIT sold last November for $290M. 2. Institutional Property Advisors (IPA), a division of Marcus & Millichap, announced the sale of The Met at Fashion Center, a three-building, 303-unit multi-housing investment property in Chandler, Ariz. The property sold for $64.8M, which equates to $213,861 per unit. IPA Senior Managing Directors Steve Gebing, and Cliff David represented the sellers, HCW Development and the Statesman Group, and procured the buyer, an institutional investment manager. 3. Cushman & Wakefield announced that six tenant-in-common (TIC) investors purchased One Camelback, located at 1 E. Camelback Road in Phoenix, from One Camelback Inc. The six TIC companies – CD Camelback LLC, Randhurst Camelback LLC, KOT Camelback LLC, SS Camelback LLC, SD Camelback LLC and RH Camelback LLC – purchased the property for $14M. Eric Wichterman, Greg Valladao and Mike Coover of Cushman & Wakefield Phoenix negotiated the sale. 4. The White Ohana LLC, an affiliate of Finisterra Corporation of Costa Mesa, CA, purchased the 33KSF Sun Mechanical building at 3951 E. Columbia St. in Tucson for $3.65M ($113 PSF). Rob Glaser, SIOR, CCIM Industrial Specialist with Cushman & Wakefield | PICOR, represented the seller, John and Beverly Cadrian of Tucson, while Ted Liles with Cresa Global, Inc. of Phoenix, represented the buyer. 5. Bill Alter, of Rein & Grossoehme Commercial Real Estate represented both the seller and the buyer on the $3.13M sale of Bargain Storage at Grand & Camelback. The property consists of 325 units with a total of 45,146 square feet and is located at 4616 W. Grand Avenue in Glendale. 6. DAUM Commercial Real Estate Services has negotiated the $2.6M sale of a 33,871-square-foot industrial warehouse building located at 1705 W. Parkside Lane in Deer Valley. Chris Rogers and Trevor McKendry of DAUM Commercial Real Estate Services represented the buyer, M & D Investments AZ, LLC. Jim Ryder of Capital Realty Advisors represented the seller, CCS Marketing, LLC of Tampa, Fla.
7. Alpha Wave Investors, a private equity investment firm, has completed its tenth full-cycle property investment with the sale of Skyline Park Apartments, a two-story, 60-unit apartment community located at 5290 South Park Ave in Tucson, for $2.6M. Alpha Wave sold the property to Ennabe Properties, Inc. out of Los Angeles, CA. Nothmarq’s Bill Hahn was the listing broker, while Alon Shnitzer of ABI Multifamily identified the buyer and facilitated the introduction of the buyer and seller. 8. Orion Investment Real Estate has announced the $2.1M ($268 per square foot) sale of a 100 percent leased retail center at the northwest corner of Dobson and Warner Roads in Chandler. The center is anchored by a Premiere LA Fitness with additional retail including Starbucks Coffee and Jack in the Box. The buyer and seller have not been disclosed. 9. Kentucky-based Springstone will develop its second Arizona behavioral health facility on 6.59 acres located near the Loop 202 and Val Vista Drive in Gilbert. Springstone purchased the property from Willis & Melrose, LLC. Philip Wurth, executive vice president with Colliers International in Greater Phoenix, negotiated the sale. A sale price was not disclosed. 10. A lease for 25KSF in Greenway Village Square at 3343 W. Greenway Rd, Phoenix, to Prestige Gymnastics was recently consummated. The owner is Southwestern Holdings, LLC. Jared Lively of Rein & Grossoehme CRE represented the Landlord and Kevin Spicer of ReMax Commercial represented the Tenant. 11. 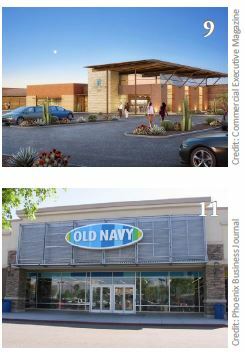 Old Navy will move into a 12.5KSF space at Superstition Gateway Shopping Center at the southwest corner of Signal Butte Rd and U.S. 60 in Mesa. The store is expected to open this fall. Velocity Retail Group finalized the lease between Old Navy and the shopping center. Dave Cheatham, Velocity’s president, and Darren Pitts, executive vice president, represented Old Navy in the transaction. Brian Gast, Velocity’s senior vice president, represented the landlord, DTL-SGW, LLC and DTR1C-SGW, LLC.